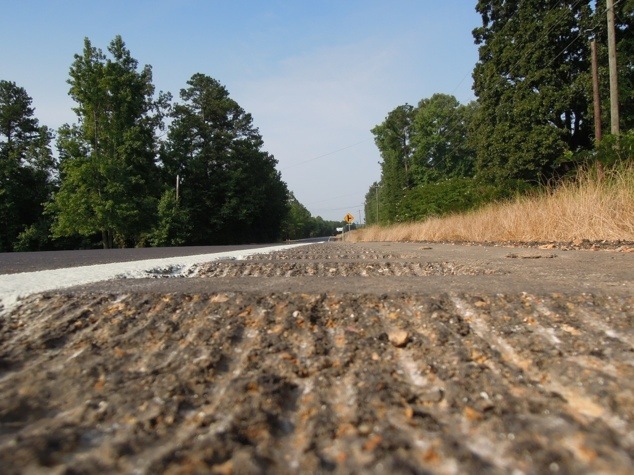 It is ironic that the Mississippi department of transportation puts out the “Share the Road” signs on rural state roads, for cyclists, yet approve a mandate to groove and mangle the asphalt with “rumble strips” to make it impossible for us to ride our bicycles on! 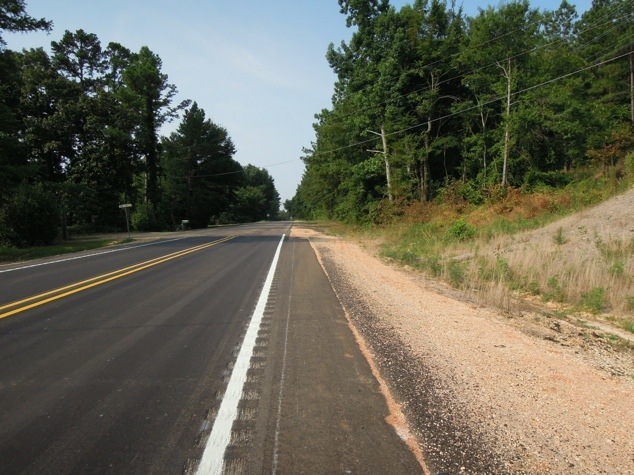 Note from the photo above that the two feet of new pavement on one of our most used bike routes here in Rankin County is unusable . . . by bikes, or cars!! In fact, the “unimproved” section in the back of the photo actually allowed MORE room for us to ride safely! Now, we must try to avoid this bike-eating, tire-flating, spoke-breaking, accident-making, no-go zone, “tumble strip” shown below!! One dot official characterized this tragedy as “an inconvenience” for us. That’s like saying it is inconvenient for our troops to walk through a mine field! The real tragedy is that if we do nothing, ALL of our roads will be a death trap for our bicycles . . . and maybe some of our riders! We already have reports of near misses along the stretch of road pictured here! And, of course, bikes are already coming in injured by the strips. There are safer alternatives. Just imagine the white line slightly raised with “singing paint” and maybe a reflector every hundred feet, or so. The paint causes an alerting, high-pitched tone for the motorist without the startling effect of the violent shaking envolked by rumble strips. Cyclists can navigate the reflective line to utilize the entire roadway, if needed. The bit of extra pavement reduces “ror” (dot term for run off road) incidents and helps prevent shoulder erosion. What a perfect world for everyone! The rumble strip dragon doesn’t have to be retired completely. Just park it near an interstate where it can keep big trucks alerted to stay on the road. There is no place for it on our roads, otherwise! Come on dot! You work for us, right? We really want to respect you, but in this case, you have to earn that respect by changing this mandate and repairing the damage done . . . please!